For us life is all about training great dogs, enjoying good hunting, and building lifelong friendships all while doing what we love the most. Just being in the great outdoors doing what I really love to do ( hunting and working dogs) is more than anyone could ask for. I have been hunting for more than 40 years. My passion comes from my father who spent countless hours teaching me outdoor skills, the craft hunting and the pleasure of hunting over a dog. I learned some of the most important life lessons while hunting and fishing. I am proud to call myself a responsible, ethical and safe hunter. I know what it takes to have a good hunt and I am dedicated to providing just that, a quality hunt. The dog is a very important part of the hunt. 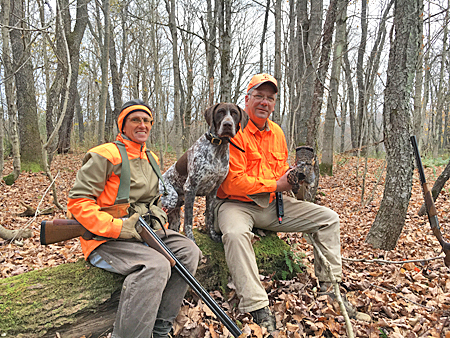 Martha and I are dedicated to helping your dog reach its potential as a hunter and companion. I am a 34 year retired veteran of the U. S. ARMY having served at several locations around the world, including a four year teaching assignment at the U.S. Military Academy at West Point and six years as a leader of a counter drug interdiction team. Now the life after the Army is an unbelievable opportunity to do what I love most. Martha and I own and operate Webfoot Outdoors. Training hunting dogs and guiding, is nothing less than a dream come true! As the co-owner of Webfoot Outdoors, I take your experience with us very seriously. I consider myself very fortunate to have been brought up in a family that hunting was part of our heritage. Generations of hunting traditions and memories have been passed down to me. I have enjoyed hunting all types of game, from fur to feather. My true passion is pursuing grouse, woodcock, and waterfowl over dogs that I have raised and trained. I have bred, raised, and trained five generations of German Shorthaired Pointers. I have been an active member of the North American Versatile Hunting Dog Association since 1990, receiving breeders awards at the NA, UT and VC level. Mark and I believe that we have some of the finest gun dogs you will ever have the privilege to hunt over. I am more than sure you will agree after a hard day in the grouse woods, goose fields, or in the duck blind. The Women’s Outdoor Challenge program was created to share the opportunities that were given to me by others through their knowledge of hunting, shooting sports, and a variety of outdoor experiences. This program is specially designed for women that are interested in the outdoors and everything it has to offer. My main goal is to educate others about hunting and the shooting sports. We guide women on a variety of activates such as camping, hunting, canoeing, backpacking, sport shooting, land navigation and many other outdoor events. Please contact me for more information. In addition to my passion for outdoor sports, I have had a full career as a certified veterinary technician. I have been involved with the full spectrum of veterinary medicine, involving various species of animals. Thirty years has found me working in private practice (large & small animal, exotic, zoo species, & wildlife) and as an adjunct Professor at SUNY Ulster Community College in their veterinary technician program. 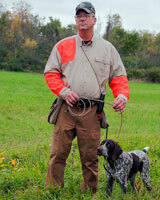 Now retired, I devote myself to training dogs, hunting, shooting and enjoying the great outdoors.